Ultra South Africa has announced its Phase 2 DJ lineup yesterday, completing the event’s final list for the second edition in the country. Gordon City, DVBBS and Oliver Heldens will share top billing with the likes of Armin van Buuren, Hardwell, Martin Garrix and Axwell^Ingrosso. South African fans can look forward to local talent such Black Coffee, Goldfish, Roger Goode, DJ Fresh, Euphonik, Kent, Chris de Vos, Dean Fuel and many more. The festival is billed as the “largest electronic music festival in Africa’s history” and is expected to be attended by over 40 000 people. 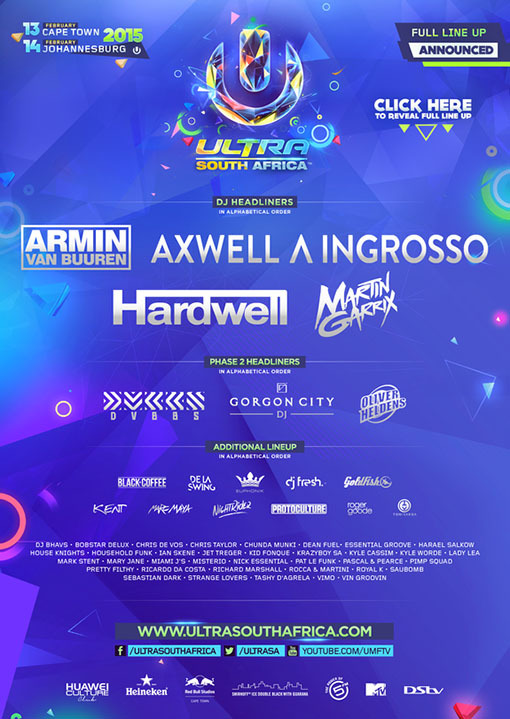 The Ultra South Africa festival will first take place on 13 February at Cape Town’s Ostrich Park and on 14 February at Johannesburg’s Nasrac Expo Grounds.